Meanwhile, in 2-quart saucepan, stir together 1 1/4 cups milk and pudding mix; cook over medium heat as directed on box. Reduce heat to low; continue cooking while adding chocolate chips, stirring until melted. Set aside. In 3-quart saucepan, heat 1/2 cup milk and marshmallows over low heat, stirring constantly, just until marshmallows are melted. Refrigerate about 30 minutes, stirring occasionally, until mixture mounds slightly when dropped from a spoon. In chilled medium bowl, beat whipping cream and peppermint extract on high speed until stiff. Gently stir in marshmallow mixture. Gently stir in 1/4 cup of the crushed candies. 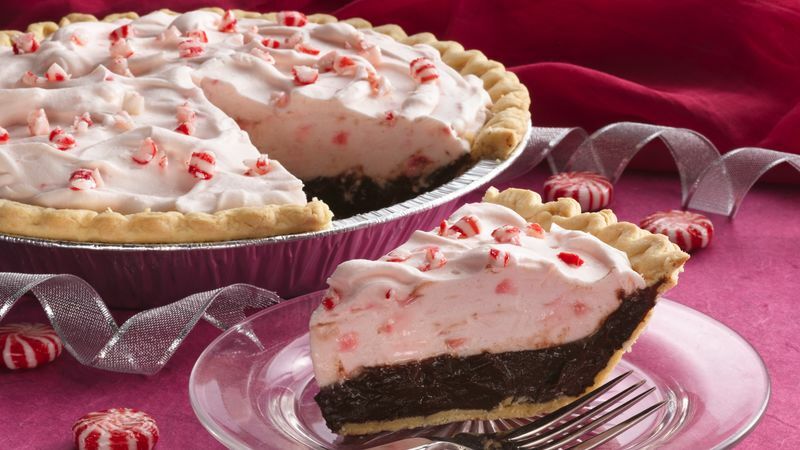 Squeeze chocolate-flavor syrup in a zigzag pattern on serving plates; top with slice of pie.